Not too terribly long ago I contemplated doing a radio show and I needed a professional sounding microphone, without the professional expense. 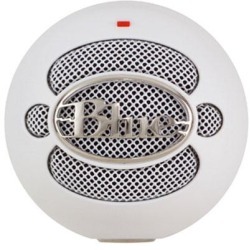 I asked around and right away, my advisers told me to check out the Blue brand of microphones, and in particular, to get the Snowball for it simplicity coupled with dynamite results. So, expecting to find it for $100 USD, instead I found it for $60 USD on Amazon.com, and they delivered it a few days later. I checked, and this is still the going price for this gem. Don’t you just love it when things go smoothly? I sure do. The microphone comes with a tripod which was easy to assemble, and the round microphone allows me to position the head straight on, at an angle to either side, or up and down at will. The mike is covered by a metal screen, and it’s STURDY – this thing could be used as a shot put if you had to, and I doubt it would break. It fits in easily to the USB port, and pretty much installs itself.